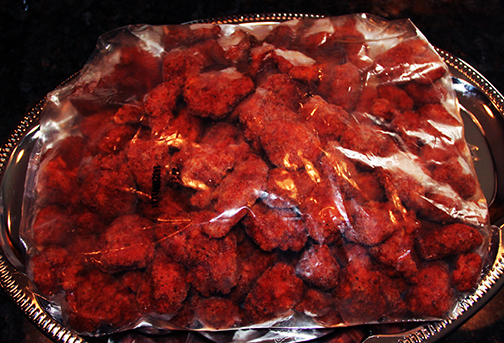 These lightly breaded boneless chicken breast chunks are coated with hot sauce. The same level of heat you would associate with an order of hot wings at a restaurant. Great snack or party food. Serve with Blue Cheese or Ranch dressing. Simply bake (frozen) in a pre heated 350°f oven for 15 minutes. Make sure there’s adequate separation between the pieces for best results. ?‍?